Diane Lee, Pauline Law and Jean Prescott. A trio of senior nurses at one trust, who have 130 years’ nursing experience between them, are bidding farewell to the NHS. 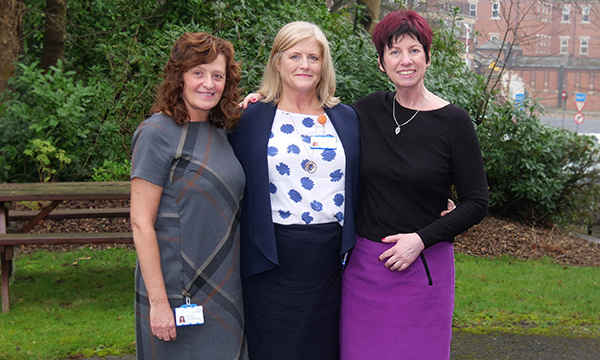 Wrightington, Wigan and Leigh NHS Foundation Trust director of nursing Pauline Law, and head of nursing for surgery and child health Jean Prescott will retire in the next few months, while head of nursing (unscheduled care) Diane Lee retired in March. Looking back, the nurses shared some of their favourite memories and observations on how the NHS has changed over the decades. For Ms Law, it was helping dying patient Sheila Marsh to be reunited one last time with her beloved horse Bronwen. A photograph of their final farewell was shared on social media and made headlines across the world, with those involved praised for their compassion. For Ms Lee, a key career moment was trying on her uniform for the first time. ‘We all practised putting our uniform on and folding our hats, we felt so important – like a proper nurse,’ she said. A uniform was not the only thing Ms Lee found appealing in her nursing career. ‘I have always been an A&E nurse and even met my husband while we were both working in the department,’ she said. But she also took note of how much had changed over the course of her career. ‘Back in the 1980s A&E used to have "quiet" times, particularly so at night, where those on shift could sit, talk, knit, watch TV; there used to be one doctor on duty who would go to bed and we would wake him if he was needed,’ she said. ‘It’s certainly not like that these days’. Ms Prescott began as a pharmacy technician in 1973, but was bit by the nursing bug. ‘As soon as I set foot on a ward I knew nursing was what I wanted to do and I loved the role from day one,’ she said. Travel, spending time with family, and volunteering are all in the pipeline for the three nurses' retirement.